Today, I am posting a card I created for Inkspirational Challenge Blog, who is being sponsored by Inspired By Stamping this week. Here is the sample card I created using Delicate Doilies and The Sky's The Limit. I puled out three different shades of green stamp pads that I had. I inked the doily with the lightest, then I took my medium shade green and inked on top and around the middle of the stamp. Lastly, I did the same thing with the darkest color, only this time, around the edges. I stamped the image on white card stock and matted it on green card stock, to finish the color scheme of the card. I then inked a sentiment from The Sky's The Limit stamp and stamped it on vellum. Pleated the vellum, trim the edges and glued to the card. Added some green to complete the card. 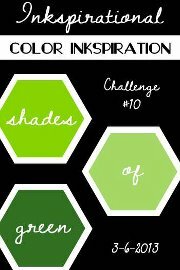 Hope you will join the girls from IBS and Inkspirational for this fun and "GREEN" challenge. 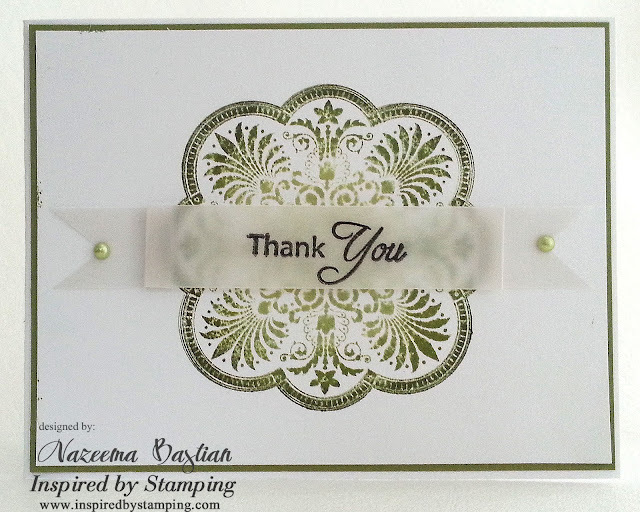 Make sure you visit Inspired By Stamping, today and everyday til the 10th. Click HERE, to join in the fun and giveaways. Love the vellum sentiment over the top of the focal image! I think this is so pretty, Calypso! The rock n roll technique works beautifully with this doily image. What a great idea! I will have to try the sentiment on vellum. It looks really great. That doily image is beautiful! LOVE your card!! Thanks so much for joining in with us at Inkspirational!! So classy! I really like how you used a color fading effect and I love the vellum paper over top. I am so glad to see your design at Inkspirational this week! Such an elegant card; that senteiment is so delicate. Simply Classy! Clean card and love the use of the vellum for the sentiment. Thanks for joining us at Scrappy Frogs this month.